Keeping up the romance when both you and your partner are on busy schedules doesn't have to be a lot of work. Stop stressing about the cooking and focus on the quality of atmosphere and the concept of sharing the meal more so than the food itself. The most important part of a romantic dinner is to make it a relaxing experience that brings the two of you closer together. 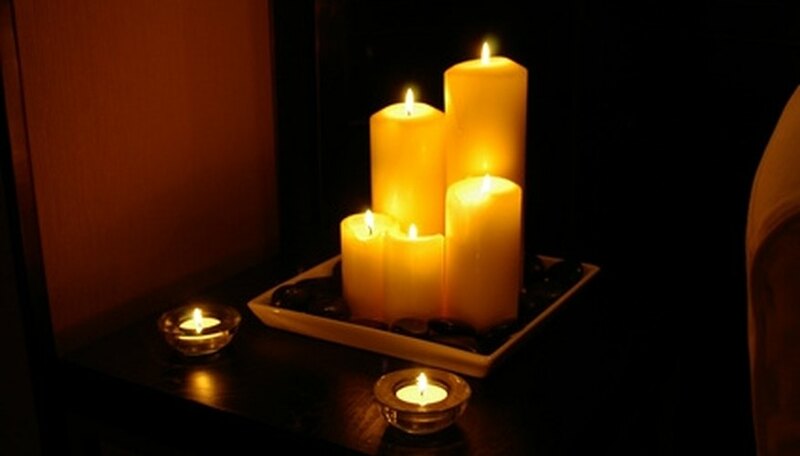 Candles are an easy way to enhance you romantic dinner setting. You don't have to go to Italy to capture the romance--just set up a small bistro or card table with a white or dark red tablecloth and a couple of candles. Do this outside of the kitchen, so you are out of your normal routine. The bedroom may be a great place to create your romantic Italian restaurant for two. Oven bake two boneless, skinless chicken breasts with traditional Italian seasonings, such as oregano and basil, but cut the garlic and onion down or out to avoid embarrassing odors. A little lemon juice and chopped tomatoes and olives will dress up the dish simply and easily, and baking it in the oven means you just toss it in and forget about it for 20 to 30 minutes. Serve a small green salad (premixed is fine) with balsamic vinegar dressing, but do so after the meal, as it aids digestion, which will help for your romantic night ahead. If you need a bit more to the meal, add penne pasta topped with a little bit of butter and seasoning, which you can boil while the chicken is cooking. Finish it all off with your favorite wine and a small piece of chocolate for each of you. This whole meal takes less than an hour, including bistro set-up time. Make your sweetheart's favorite sandwich and side dishes and put it all in a picnic basket to serve next to the fireplace, woodstove, or other warm, comfortable area in your home. Light the area with candles and lay out a blanket. Start the meal with fresh fruit, and then move to the sandwiches and side dishes. Except for the sandwiches themselves, serve everything in a single container so you both share each experience, touching fingers or forks as you dip into the dishes. A small bottle of your favorite wine or sparkling cider will make the occasion more festive and romantic. The atmosphere is much more important than the time spent putting it together, so spend more of your time setting up the room than preparing the food. In the summer, hold your romantic picnic on the back porch. Create the feel of an intimate Asian restaurant right in your own home for your dinner for two. Place a freestanding electric burner (hot plate style) in the center of the table, then surround it with cut stir-fry veggies--either your own fresh-cut or from a combination pack at the grocery store. Place bottles of soy sauce, peanut or other cooking oil, and rice vinegar near the hot plate, as well as a large bowl of cooked rice (frozen or minute variety) or precooked soba noodles. Shave ultra-thin slices of meat off a frozen chicken breast or steak and set those out as well. Start cooking the meal over your hot plate together, heating it all as you stir it together, similar to a Mongolian grill. Cook in small portions, stir-frying the meat first, then adding veggies, then noodles, and share each portion as you cook it so you both get the freshest dinner possible. Hirsh, Anne. "Quick Romantic Dinner Ideas." Dating Tips - Match.com, https://datingtips.match.com/quick-romantic-dinner-ideas-7260059.html. Accessed 18 April 2019.